Do you know who's watching you right now? Right this very minute! Could it be the FBI? The CIA? The KGB? Or maybe even Walmart? Yeah. Every single one of them gauging your every single movement from dusk till dawn. Not unlike the funky Directors: the Coen Brothers; and those Actors: John Malkovich, Brad Pitt, George Clooney, Frances McDormand, with Tilda Swindon. But only in 2008; and for about 96 minutes. Hello, folks. Please allow me to introduce you to a number of quite unusual looking characters. First off, there's the recently sacked FBI agent, Osbourne Cox (John Malkovitch), whose wife, Katie (Tilda Swinton), is secretly having an affair with a married man -- called Harry Pfarrer (George Clooney) -- and now, unsure of what to do with himself, decides to write a book about his time at the Agency. Next, there's the head administrator of the 'Hard Bodies' gymnasium named Linda Litzke (Frances McDormand). At the moment she's a internet dater that's trying to raise some funds for some plastic surgery -- plus -- by whim of fate, starts seeing Harry, the man who is having an affair with Osbourne’s wife. After her, there is Chad Feldheimer (Brad Pitt). He works with Linda at the gym. And one day he comes across a disk that belongs to Osbourne -- containing his work -- and goes to Linda, and tells her that if they hand it back to him, he, in turn, will give them a token reward. But no. He doesn't. He doesn't want to give them any money at all. And neither will the Russian Embassy either. They want more. But before I can get to that, folks, let me tell you about the last person I wish to introduce you to -- Harry -- the love rat. OK, so by this time in the tale, Katie has left Osbourne, and while Harry’s wife's away, he moves in with Kate. However, whilst Chad tries to get more information for the Russian’s by breaking into Osborne’s house, he mistakenly discover's Harry standing there with a gun in his hand. Oh, dear! I suppose that's why what next transpires gets shot dead and then stuffed into a closet. As Linda is confused - her boss is not amused - Harry loses the plot - and at the end of the day the FBI ends up winning the job lot. 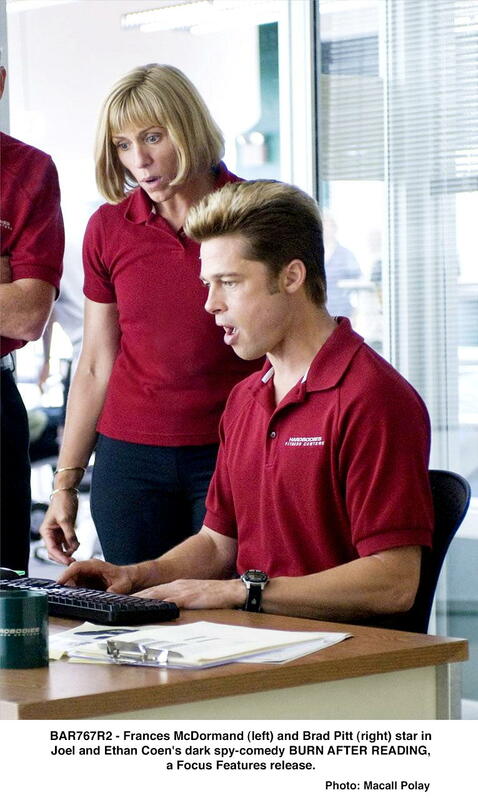 Now I've to be honest with you, folks, for my own personal tastes 'Burn After Reading' is the type of film where character overpowers plot quite a lot. Hey! Please don't get the wrong idea. I did enjoy watching this movie. It's just... errr.. how can I explain this to you? Oh! I know. Story-wise, this film is one of those films that flimflams all over the place, and takes a long time before it settles down so you can figure out where it is actually headed. But then, once you've eventually caught up to what you think is going to happen next, POW! It takes a sudden U turn. And goes off in a completely different direction altogether. Again. Please don't take what I say as a slight by any stretch of the imagination. It's just that I found this movie to be of a very acquired taste. I know my Dad will hate it because it's very jumpy in tone. I know my older brother will love it because it's jammed packed full of conspiracy theories. And as for me on the other hand, well, I found it quite charming all in all. As the characters were all pleasant enough to watch, and in someway identifiable and understandable in what they did and who they are. In roll call fashion: Brad is the young energetic pal. George is the philandering husband. Tilda is the cold fish. Linda is the self-deprecating woman yearning for love. And John is the frustrated husband down on his luck. Having said that, though, I did find that the main problem when you have so many characters within the mix, plus so many discernible attributes as well, is that the story in itself -- as I said before -- can appear rather benign and mumbled in places. Anyway. Enough of my stuff and nonsense for the time being. Here. Let's have some filmic-fact. (1) 'Focus Features' first screened this $37 million dollar production at the 'Venice Film Festival' on the 27th of August, 2008, and eventually clawed back $161 million dollars at the box office. (2) The majority of this movie was shot on location throughout the American states of New York, New Jersey, and Columbia. In New York you might've noticed Steiner Studios, Brooklyn Heights, New Rochelle, Bronx Community College, and Time Square. In New Jersey you might've noticed the Paramus branch of 'Tower Records'. And in the District of Columbia there were certain places captured in around Washington. (3) Loosely translated, this project was entitled 'Hot Alerts' in Greece; and 'Burn' in Hungary. (4) This was the first picture directed by the Coen Brothers since 'Miller's Crossing' not photographed by their regular cameraman, Roger Deakins, because he was committed to shoot 'Revolutionary Road' for Sam Mendes at the time. (5) Please take note that the CIA agent played by J.K. Simmons never stands up once throughout this entire movie. Hmmm. Lazy sod. (6) In the script the pseudo-film, 'Coming up Daisy', was actually called 'Tell Me That Again'. Yep! It was changed for the sheer hell of it. (7) The word 'f*ck' is said 62 times throughout this movie, and six of those 'f*cks' appeared in the first two minutes. (8) When the Coen Brothers devised this film, they wrote it in mind with all of the actors they eventually cast, except Tilda Swinton. 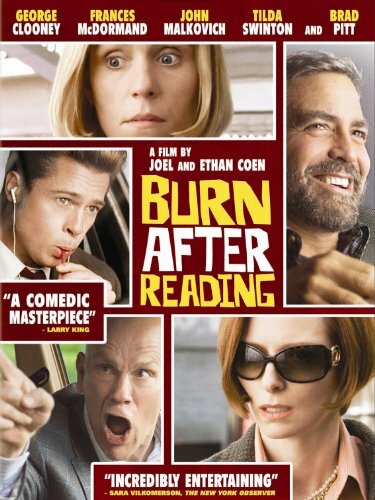 Now before I bugger off, folks, I would just like to add that 'Burn After Reading' isn't ashamed about its mumbled tone. In fact, during the numerous 'FBI backroom' scenes, it openly states this stance squarely in the audiences face. And to me, it is mainly due to this type of honesty that makes this mumbled film such a great mumbled film. With a story-line and a group of actors whom convey their characters so well, that you can't help but sit back and try to piece the story all together as it plods along. Also, it does ask a very pertinent question at the end of it. One that kind of finalizes the story in a very subtle way -- 'who is watching who and for why?'. Hmmm?